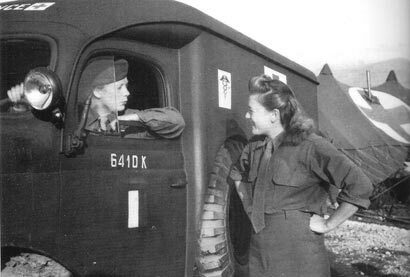 An ambulance woman belonging to the female corps of the 3rd Medical Battalion of the A.F.A.T., she was, like a few thousand women and girls, nurses, ambulance women, signals specialists or secretaries and interpreters, fully incorporated into the C.E.F. Alphonsine Loretti was killed on 5 February 1944 as she was giving first aid to some of the Belvedere wounded at San Elia on the “death road”. The German artillery targeted her vehicle, and, with both legs severed, she died from her injuries shortly afterwards. She illustrates perfectly the selflessness of those women who did not hesitate to leave their job and family to fight at the front. She was buried on 6 February 1944 at the same time as Lieutenant Jordy. Marshal Juin paid her an eloquent tribute in a short speech on 6 February 1944 and also later on in his work on the Italian campaign. She was the first woman to be awarded the military medal.